This is the second part to the article about the space elevator. In this post I will focus on the safety issues of a space elevator. The space elevator is a gigantic concept and as such it has many safety issues that would have to be resolved before construction begins. 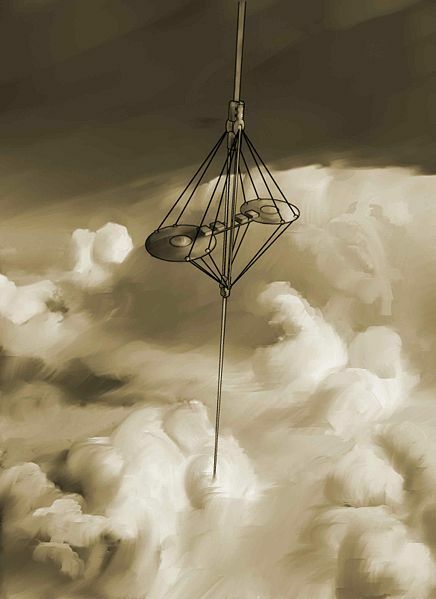 A space elevator would present a navigational hazard, both to aircraft and spacecraft. Aircraft could be dealt with by means of simple air-traffic control restrictions. Similarly for spacecraft, a space-traffic control station should be built on the space elevator to make sure no spacecraft are on a collision course with the space elevator. Since the space elevator will take most of the traffic between the Earth and space, there should be very few spacecraft in usage. If nothing were done, essentially all satellites with perigees below the top of the space elevator would eventually collide with the elevator cable and cause structural failure. First of all, the stations on the space elevator can take over most of the functions that today are being fulfilled by satellites, at least for the whole Earth’s hemisphere centered on where the space elevator is anchored. Unless another space elevator is built on the opposite hemisphere, some satellites will still be necessary for global coverage, so just like for spacecraft the space-traffic control station on the space elevator should keep watch on all satellites in orbit. If a satellite is found to be on an imminent collision course with the space elevator, the best solution would be for the satellite to correct it’s orbit in order to avoid it. So it would be a good idea to equip all satellites with such capabilities. Another way to go would be to control the slight oscillations of the cable that occur each time a climber is sent up the space elevator. This would be easier if the cable was anchored on a mobile platform (such as an ocean-going vessel). The platform could be moved slightly in order to produce a controlled oscillation which will move the space elevator’s cable enough to avoid any obstacle. Otherwise with a stationary base station the interval at which climbers are sent up will have to be carefully choreographed in order to control the oscillations. It is quite obvious that all space debris should be first cleared up prior to the construction of a space elevator. However if a satellite were to stop functioning or break up into small pieces, the resulting space debris should be cleaned up immediately “garbage collector” spacecraft in order to avoid a collision. If no such spacecraft is available on time, the space elevator would have to move out of the way as described in the previous paragraph about controlled oscillations. The space elevator should also be equipped with laser to vaporize the microscopic space debris that come into it’s path. Meteoroids present another problem, they would not be very predictable and little time would be available to detect and track them as they approach Earth. It is likely that a space elevator would still suffer impacts of some kind, no matter how carefully it is guarded. The solution here would be the use of multiple parallel cables separated from each other by struts, with sufficient margin of safety that severing just one or two strands still allows the surviving strands to hold the elevator’s entire weight while repairs are performed. If the strands are properly arranged, no single impact would be able to sever enough of them to overwhelm the surviving strands and cause the whole structure to collapse. Micrometeorites are an even bigger problem. They are tiny high-speed particles found in high concentrations at certain altitudes. Avoiding them is essentially impossible, and they will cause strands of the elevator to be continuously severed. Redundant cables will help a lot in this case, but there is something that can be done to prevent a single micrometeorite to sever an entire cable. Constructing the cable as a mesh instead of a ribbon will help to prevent collateral damage from each micrometeorite impact. A failure cascade could occur if a fiber strand fails and causes a catastrophic chain reaction. Breaking a fiber will result in a pair of de-tensioning waves moving apart at the speed of sound in the fiber, with the fiber segments behind each wave moving at over 1,000 m/s. That’s faster than the muzzle velocity of a standard .223 caliber (5.56 mm) round fired from an M16 rifle. Unless these fast-moving projectiles can be stopped safely, they will break yet other fibers, initiating a failure cascade capable of severing an entire cable. This is by far the biggest challenge of a space elevator. Building a laser defense system at regular intervals along the cable could in theory vaporize most of those fiber segments, but some will probably still hit the cable. Also, since this would be a very delicate high-speed operation, the laser could accidentally damage the cable. So the only thing that could stop a catastrophic failure here would be a redundant cable system as described in the “Meteoroids and micrometeorites” section. Corrosion could also be a risk, especially to a thinly built cable like in most space elevator designs. In the upper atmosphere, atomic oxygen steadily eats away at most materials. Therefore the cable would need to either be made from a corrosion-resistant material or have a corrosion-resistant coating, adding to weight. Another solution would be to continuously renew the cable’s surface by using climbers specialized for that purpose. This process would depend on the cable’s composition and it could be done on the nanoscale (by replacing individual fibers) or in segments. The section of the space elevator cable that is in the Earth’s atmosphere is at risk from the wind, ice and lightning. Fortunately, as long as the cables’s anchor remains within two degrees of the equator, it will be in the quiet zone between the Earth’s Hadley cells, where there is relatively little violent weather. The few storms that would occur could be avoided by moving the floating anchor platform. The lightning risk can be minimized by using a non-conductive fiber with a water-resistant coating to help prevent a conductive buildup from forming. Ice forming on the cable also presents a potential problem. It could add significantly to the cable’s weight and affect the passage of the climbers. Also, ice falling from the cable could damage the climbers below or the cable itself. To get rid of the ice, special climbers could regularly be sent to scrape it off. Vibrational harmonics and uncontrolled oscillations of the cable could build up and eventually cause the cable to rupture. This is why it is very important to control those oscillations to prevent disaster. However, a suitable damping systems within the cable should be constructed in case it all gets out of control. That way it may be possible to dampen the resonant frequency against the Earth’s magnetosphere. The ionizing radiation present above Earth’s atmosphere may cause damage to materials within both the cable and climbers. This is why the whole structure should be constantly scanned and repaired where damage occurs. 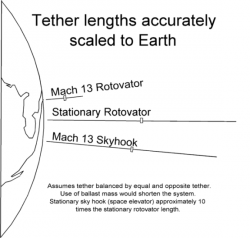 The space elevator would also run through the Van Allen radiation belts. This would not be a problem for most freight, but the amount of time a climber spends in this region would cause radiation poisoning to any unshielded human or other living things. Unless an effective shielding method is developed, passengers would have to travel by other spacelaunch methods, while space elevators haul bulk cargo. Unfortunately the best radiation shielding materials are very heavy. One possible solution would be to use the cargo as shielding around the passenger cabin located in the center of the climber. Any structure as large as a space elevator will have massive numbers of tiny defects in the construction material. This is why specialized climbers will have to constantly scan the cable and repair any discovered defects and weaknesses. The space elevator will be a great economical and technological advantage to those that control it. Therefore, this implies that there would be a group of people unhappy with such a situation. If acts of sabotage or military attacks take place, the space elevator would be in grave danger. To minimize the risk of sabotage, tight security measures should be taken. An anti-missile defense system should also be installed on the space elevator to prevent military attacks from the ground or orbit. 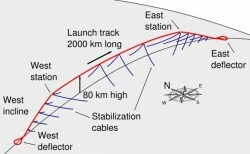 Cut near the anchor point: If the space elevator cable is cut at its anchor point on the Earth’s surface, the outward force exerted by the counterweight would cause the entire structure to rise upward into an unstable orbit or escape Earth’s gravity altogether and be flung out into interplanetary space. Bringing the whole structure back and anchoring it down in it’s former position would prove extremely difficult if even possible. In such a scenario, it would probably be much easier to simply build a new space elevator. Cut up to about 25,000 km: If the cable is severed at higher altitude, up to about 25,000 km, the lower portion of the elevator would fall down to Earth and wrap itself along the equator east of the anchor point, while the now unbalanced upper portion would rise to a higher orbit. Some science fiction writers (such as David Gerrold in Jumping off the Planet and Kim Stanley Robinson in Red Mars) have suggested that such a failure would be catastrophic, with the thousands of kilometers of falling cable creating a swath of meteoric destruction along the planet’s equator. However, in most designs, the upper portion of any cable that fell to Earth would burn up in the atmosphere since the cable has a very low mass (roughly 1 kg per kilometer). Cut at the counterweight: If the break occurred at the counterweight side of the elevator, the whole cable would fall down if not prevented by an early self-destruct of the cable shortly below it. Depending on the size, however, it would burn up on re-entry anyway. Simulations have shown that as the descending portion of the cable wraps around the Earth, the stress on the remaining length of cable increases, resulting in its upper sections breaking off and being flung away. As for the counterweight itself, it would rise to a higher orbit or be flung out into interplanetary space, depending on its mass. It is almost inevitable that some climbers will accidentally fall off the space elevator at some point. Their subsequent fate would depend upon their initial altitude. 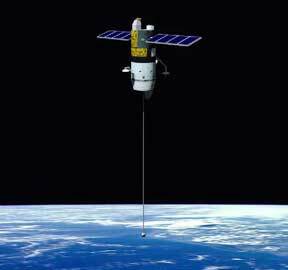 Except at geostationary altitude, an object on a space elevator is not in a stable orbit and so its trajectory will not remain parallel to it. The object will instead enter an elliptical orbit, the characteristics of which depend on where the object was on the space elevator when it fell off. If the initial altitude of the climber falling off of the space elevator is less than 23,000 km, its orbit will have an apogee at the altitude where it was released from the elevator and a perigee within Earth’s atmosphere. This means that it will intersect the atmosphere within a few hours, and not complete an entire orbit. Unless it has some way of slowing it’s descent speed or gets rescued by a spacecraft, the climber would burn up in the atmosphere. Above the critical altitude of 23,000 km, the perigee is above the atmosphere and the climber will be able to complete a full orbit to return to the altitude it started from. By then the elevator would have moved away from that position, but a spacecraft could be dispatched to retrieve the climber. The lower the altitude at which the climber falls off, the greater the eccentricity of its orbit. 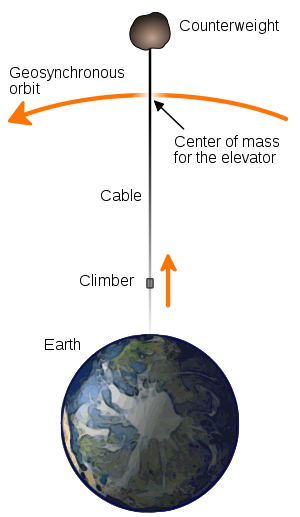 If the climber falls off at the geostationary altitude itself, it will remain nearly motionless relative to the elevator just as in conventional orbital flight. At higher altitudes the climber would again be in an elliptical orbit, this time with a perigee at the altitude the object was released from and an apogee somewhere higher than that. The eccentricity of the orbit would increase with the altitude from which the climber is released. Above 47,000 km, however, a climber that falls off of the space elevator would have a velocity greater than the local escape velocity of Earth. This means that the climber would be flung out into interplanetary space, and if there were any people present on board it might prove difficult to rescue them. Despite all the risks involved, a space elevator would be a very profitable project. It would bring down the spacelaunch costs considerably and would open up outer space for colonization as the final frontier. …space-elevator (orbital station bike wheel-1g)… geostationary orbit, a huge “bike-wheel” is gyrating around its own axis for have 1g-centrifugal. Wheel held in place with 4 CABLES (two of them with a track for Train) FORMING THE STRUCTURE OF A RHOMBUS♦ (minor diagonal of rhombus is the gyration-axis of the Station-Wheel)…rhombus´s below, the carbon nanotubes Track towards Earth…rhombus´s above, the Cable towards the higher counterweight…if…WHEEL´s RADIUS = 250 mts… Wheel gyration´s axis length = rhombus´s minor diagonal = Wheel´s radius = 250 mts…Cable´s length of the rhombus´s side = Wheel diameter = 500 mts. Wheel´s ZONE-1g: habitable length = 1571 mts*50 mts wide*50 mts height, gyrating 360º each 31 seconds, angular-speed = 11.61º/sec, linear-speed = 182 kms/h… Station-Wheel´s GYRATION: AXIS IN PERPENDICULAR (90º) ORIENTATION TO THE ORBITAL TRAJECTORY…and so, while Station-Wheel follows its geostationary orbit, the Wheel does Not changes the spatial-orientation of its axis, and thus there are Not Precession forces actuating (and thus there is Not collision tendency of the Station-Wheel against the rhombus´s cables…but the system must supporting lateral charges against Track produced by the Coriolis effect when Train goes upwards or downwards…), the gyroscopic-rigidity contributes for maintaining forever the gyration-axis perpendicular to orbital trajectory… When the Maglev Train slowly arrives, using now their retractable cogwheels by the Zipper-Track (zippers installed on the same Maglev-Track), Train stops in Geo 0g-Station placed over one extreme of the gyration-axis… Passengers disembark and entering into gyratory circular corridor, they take now the interior-elevator of one of the Wheel´s hollow-radius, and tunnel “descending” till Hotel into the final Zone-1g…where while Station-Wheel goes turning, the immense O2 producer Hydroponics Garden receives a filtered Sun light…and there are Earth´s awesome views. …space elevator (fly me to the moon)…a hyper-speed vertical electric train of magnetic levitation with Moon destination…awaits passengers each perigee, in the gyratory World´s around in 27.55 days Pendant Station located between 30 and 43,659 kms (by elliptic Moon orbit) from Earth surface, and by double track of graphene, up and down, with 347,862 kms in length, surface to surface, at the upper end attached to the Moon surfaced… Just in time stratospheric at 30 kms high, appears on horizon hanging Moon´s below, Pendant Station slow (268 kms/hour)…passengers climb in air transport of vertical takeoff and landing in high altitude…airplane lands on Station and connects under it the pressurized downstairs, for passengers descend within from the windy exterior deck… Train with Moon destination placed on track-up, will depart after 1 hour… THE TRAIN DEPARTS►… distance = 347,862 kms…medium-speed = 5,000 kms/hour…total travel time = 70 hours in weightlessness… day 2.9: train is vertical on surface at zero-speed, the passengers disembark at destination: Moon Station. …go to Moon only in spacecraft. Do not is possible make a Station hanging Moon´s below that enters in Earth´s Atmosphere because then…due to rotation´s speed of Earth, approx. 1674 kms/h, this huge supersonic wind speed would do impossible embarking on Station. …interstellar travel (Alpha Centauri C: 1g).. passengers climb in space-elevator to the ship…awaits them in asteroid Toutatis, which long ago placed in geostationary orbit.. Day 1: zero-speed…distance 40.68 Billion kms (4.068*10¹³)..total travel time = 1490 days (4 years and 1 month)… THE SHIP TAKEOFF►… 354 days to 1 G (9.8 mts/sec²) of CONSTANT ACCELERATION (weightlessness solved the problem), the ship with its powerful Antimatter rocket engines working tirelessly…antigravity fields generator run forwards working, and no collisions with anything…the ship reaches light-speed and…disappears…to enter into “superluminal dimension”…and continues traveling at superluminal-speed > 1c… Day 745 (2 years and 15 days): the ship reaches the halfway…maximum superluminal-speed = 2.1c…”ladies and gentlemen please belts, for a few minutes while the motors are OFF ship will be in weightlessness during maneuver”…the ship rotates 180º around in axis (perpendicular to the longitudinal axis of momentum).. ON engines again and… ◄starts to brake… Day 1136: the ship slows light-speed and…appears…descends again to the “subluminal dimension”… 354 days more decelerating and the ship is at zero-speed, the passengers disembark at destination, a planet of Alpha Centauri C.